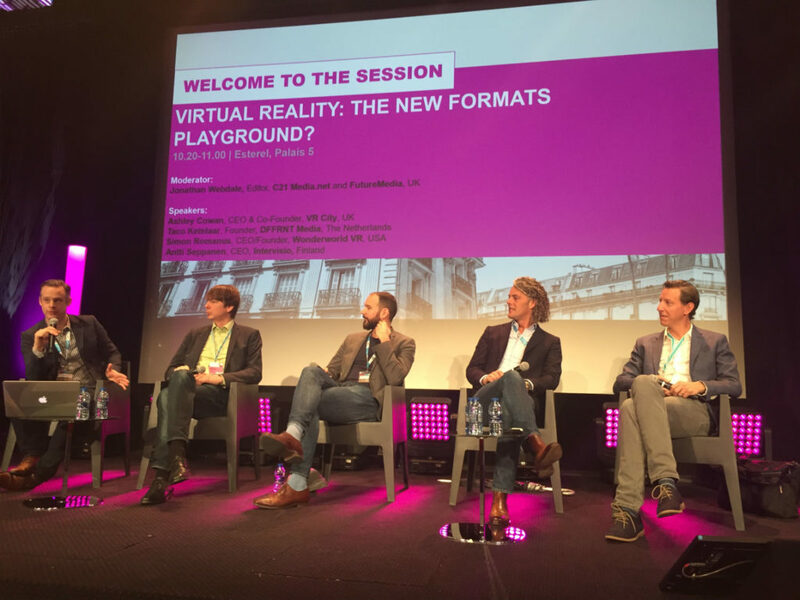 Virtual reality is going to be a big theme throughout this year’s MIPTV conference, but MIPDoc and MIPFormats got the VR ball rolling this weekend. Starting with a State of the Market session, helmed by StoryTech Immersive‘s Brian Seth Hurst, and featuring (left to right) Okio Studio‘s Raphaël Beaugrand, Virtual Content Group‘s Torsten Hoffman and BeVRR‘s Ellie Ngim. “The Gartner hype cycle says VR has now hit slope of enlightenment. I don’t think we’re there yet. It’s going to be a bumpy ride,” said Hoffman, referring to the scepticism around VR that is still common within the television industry, as in other sectors. Hurst was optimistic however. “VR is the fastest-moving sector I’ve ever been in… and there are ways to get funds for scrappy independent producers,” he said. Indeed, Hurst showed stats suggesting that “travel and adventure” was the most-requested theme in terms of VR content right now, with 74% of audiences demanding it. Great news for MIPDoc-goers! Ngim talked about the impact that great VR content can have. “VR is particularly effective at creating emotional connection. UNICEF’s film with Chris Milk raised seven times more than a normal film,” she said. There was plenty more in the debate, with the session available to watch in full on YouTube. 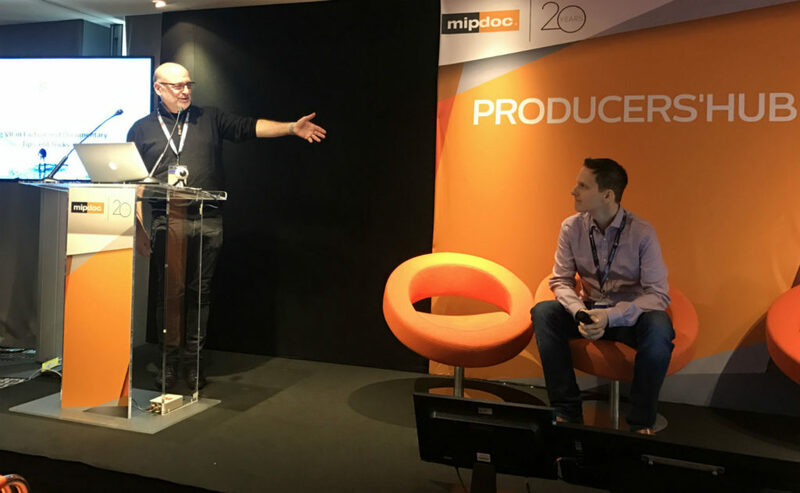 On Sunday, a MIPDoc session on “using VR in factual and documentary” offered producers some tips and tricks from Torsten Hoffman, CEO of Virtual Content Group, and Brian Seth Hurst, president and chief storyteller at StoryTech Immersive. Hurst showed some 360-degree experiences, starting with The Circus, based on a Showtime TV series of the same name. The 360 offshoot told the stories of people attending rallies by (then) presidential candidates Donald Trump and Hillary Clinton. “There aren’t any great news and doc editors in virtual reality yet, so we decided to get a traditional news and doc editor, sit them at the console… and we had him learn from the VR editor that sat behind him. You want to bring best practices of documentary editing and filmmaking into VR,” said Hurst. However, he stressed that this must not be a limitation on exploring some of the new aspects of VR. Writing for VR is also completely different, suggested Hurst. “The power actually returns to the writer in VR… it’s theatre, and when we go to sell the script or get a script approved, it’s an experiential script. It’s part Charles Dickens, part Arthur Miller and part your television or film writer,” he said. Hurst warned filmmakers not to “just plunk the camera down”, citing the examples of VR documentaries that feel like: “Let’s take you into Syria: plunk, there’s the camera… it’s not storytelling”. He also talked up the merits of framing shots and using lighting and sound to direct viewer attention. Hurst showed the film’s use of cuts in VR – “People tell you that you can’t cut! That’s us doing it right there!” – and talked about achieving slow-motion footage by shooting at 120 frames-per-second, which he said was a first for VR. “We’re moving from the ‘wow’ of VR into artistry,” he said, showing a slow-motion battle scene. He warned against gimmickry, saying filmmakers must ensure that the technology serves the story rather than the other way around. Hurst also said they should try to shoot in the highest-resolution possible to future-proof their content, while Hoffman talked about the coming potential of “true VR” – or ‘room-scale’ VR – where viewers will be able to move around a scene and, via haptic gloves, touch and manipulate things within it. Moderated by C21 Media editor Jonathan Webdale, the panel featured (left to right) Antti Seppänen, CEO of Intervisio; Ashley Cowan, CEO and co-founder of VR City; Taco Ketelaar, DFFRNT MEDIA founder; and CEO/founder Simon Romanus of Wonderworld. Seppänen of Intervisio presented his projects first, including Tilt, a weekly TV show on Fox that covers the world of electronic gaming. It is now Finland’s leading media for gamers, combining the viewing experience with gaming elements. Another show, Lost in Time, features similar interactive elements and doesn’t even require headsets. The show has received a positive response from audiences and, now in its second season, has just been recommissioned for a third, slated to appear in fall 2017. “It’s been doing really well,” said Seppänen. He added that there’s a significant difference between watching VR onscreen and experiencing an environment for yourself. After, Cowan presented VR City, which just filmed and livestreamed the MTV VMAs—marking the first time in the world that something was livestreamed in VR. VR City is also working with ITV Sports and a VR talk show for the BBC. The talk show takes place in a coffee shop, with a host on one side of the viewer and the interviewee on the other. The BBC “wanted to experiment with the idea of how presence can augment existing well-known TV formats,” said Cowan. Ideally, users wear a headset while sitting at a table, then is “transported to this coffee shop in East London to sit in on this conversation.” The show works with Samsung Gear VR or Google Cardboard. “We didn’t want to challenge anyone too much,” Cowan went on. “We didn’t want to put them on the moon, or in the Antarctic.” Instead, VR City focused on the easiest route to making people feel present. “Once you’ve done that, you can build on a user’s relationship with the show. You can get that much more intimate with the show.” For example, does this more intimate experience make you feel like the talk show host is your friend, over time? He speculated that perhaps, in the future, users can influence the conversation’s direction. They’re also considering gaming elements. The Voice’s VR experience begins in the makeup room, where the “contestant” gets her hair and makeup done. The jury and other contestants all mill around you. Then the stage manager tells you it’s nearly time; as you prepare for your debut, you can hear other performances in progress, creating a sense of anticipation and nervousness. “The next phase is that you go up on stage and are in front of a huge crowd of people, the jury members with their backs to you. Then you start virtually singing. Either a jury member spins around or not,” Ketelaar described. Last but certainly not least, Romanus presented Wonderworld VR’s latest idea: Witness VR, a format inspired by the true-crime hit podcast Serial. “We came up with this story after thinking, ‘How can you make a VR story out of the podcast Serial? How can you be a witness in those cases?’” Romanus said. The show gathers fuel from the fact that over 1500 criminals are wrongfully convicted in California alone, and invites you to “become a witness to the most suspenseful crimes in full VR.” It has a bit of an Unsolved Mysteries feel (for the American viewers out there!). “The formats are what you see in traditional shows,” said Romanus. “You have the host, the crime, deconstruction of the case,” and the verdict—guilty or not? Each episode ends by asking the audience this question.